Yesterday morning I spent 3 hours at the thrift store. It was as if I had walked into an episode of Thrift Wars. I was so intrigued, I ended up spending my entire morning there. 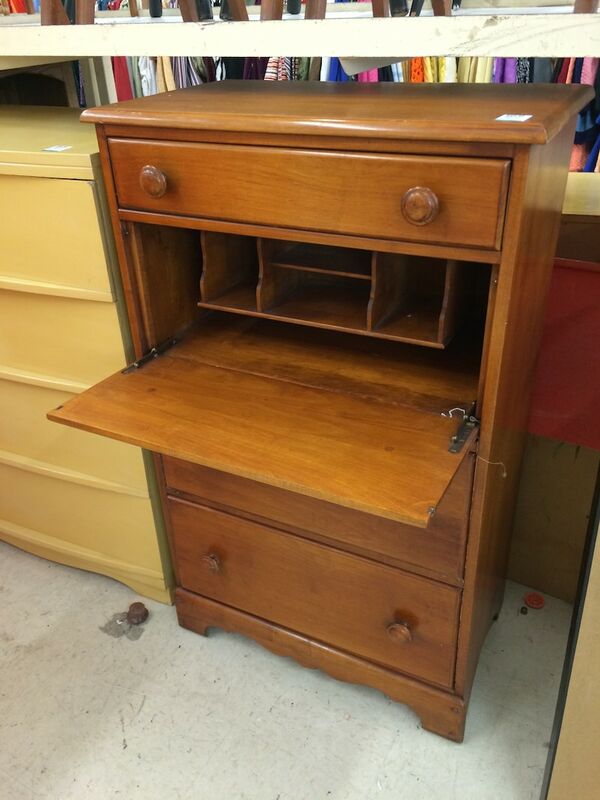 I couldn’t believe I had seen such an amazing, clean piece for……(get this!)…..$35! You could have put this in your dining room and ate off of it the very same night! Who in the world is Pete?? Pete walks over at that time, with this beauty of a print in his hands, and introduces himself as a flea market vendor. I’m always interested in furniture flippers and how and where they sell their goods. But what should have been a quick “Hey, congrats, Pete, you found a nice piece there….” turned into a 3-hour ordeal. He was actually waiting for his art dealer friend to show up to give him the print a “once-over” to see if it was valuable. While we waited, we talked about where all the best Flea Markets are (he told me about The Big Flea Market which is held bi-monthly across the U.S., I believe. Next one is in NYC). He also told me about the Brimfield Antique Show which is miles and miles long of amazing stuff and people drive hours just to attend. I had never heard of these flea markets. When his friend showed up, I stood there watching in awe as his friend pulled out this jewelers magnifying glass and started inspecting it! 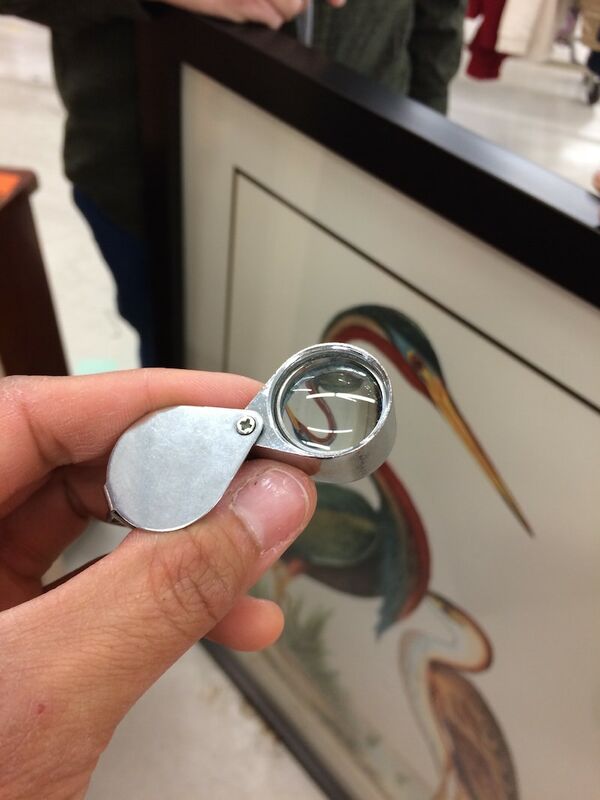 I mean, I know that people scope out good art from the thrift store, but to pull out the glass….. That was a whole ‘nutha level. Apparently, depending on the technique used, you can tell “good art” with this little thing. This guy said he never travels without it after learning his lesson and losing good art because he couldn’t tell it was valuable. Then they busted out his cell phone, scanned a barcode on the back, trying to check eBay to see what the going rate was on the picture. The thrift store was asking $50 for the whole piece. Still a deal, but not enough of a profit to sell at the flea market. I felt like I was standing in the middle of some HGTV show or something and that cameras would come out of the woodwork any moment! What’s even funnier is that we all three stood around sharing stories of “hoarding” and how our spouses just don’t understand. We were united by junk. You gotta be ready, right?? After a couple hours, I had to try to get out of there, but Pete wasn’t done with his lessons yet, and the Thrift Wars were about to get even more interesting. 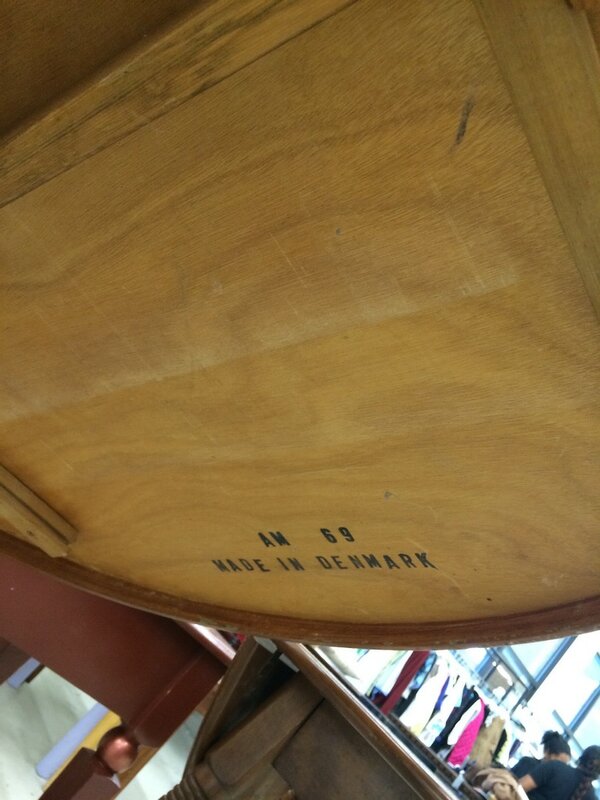 Apparently, this is a Danish mod table. This is his “taste” so he gravitates towards it. Knows it like the back of his hand. And you won’t believe the price. 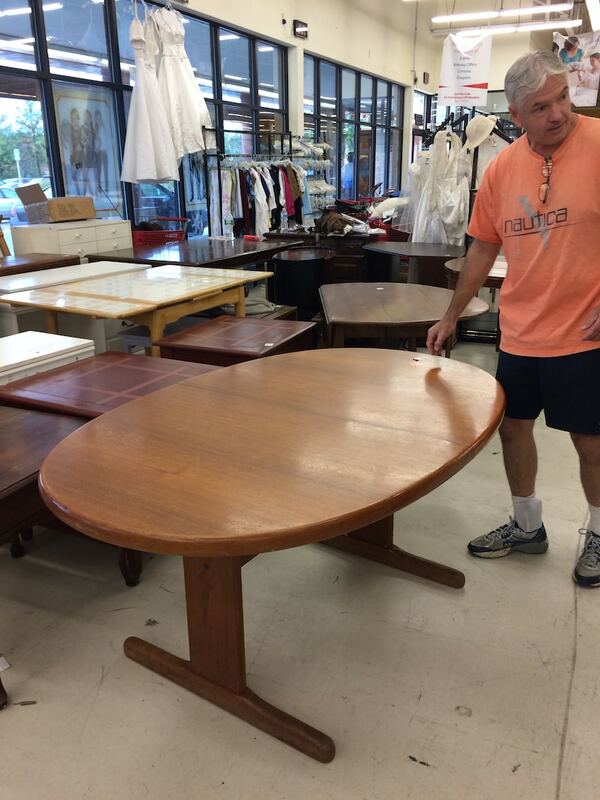 According to Pete, this table could easily be flipped and sold for least $600. He wanted to prove to me it was authentic, so he tipped it over. It doesn’t get any more “quality” than that! A local artist friend to Pete was interested in the table and asked him to “watch it” for him so he could empty out his truck and come back to buy it. Well, before you know it, someone else had his hands all over it, claiming he had bought the table just an hour before! He hovered over it like a protective animal over his meal, pulling out his receipts to prove that he was the owner, not Pete’s friend. As they all stood around checking receipts, I could have pulled up a chair with a big tub of popcorn and watched this drama play out. It was so interesting to see the salavating and near-flared tempers! 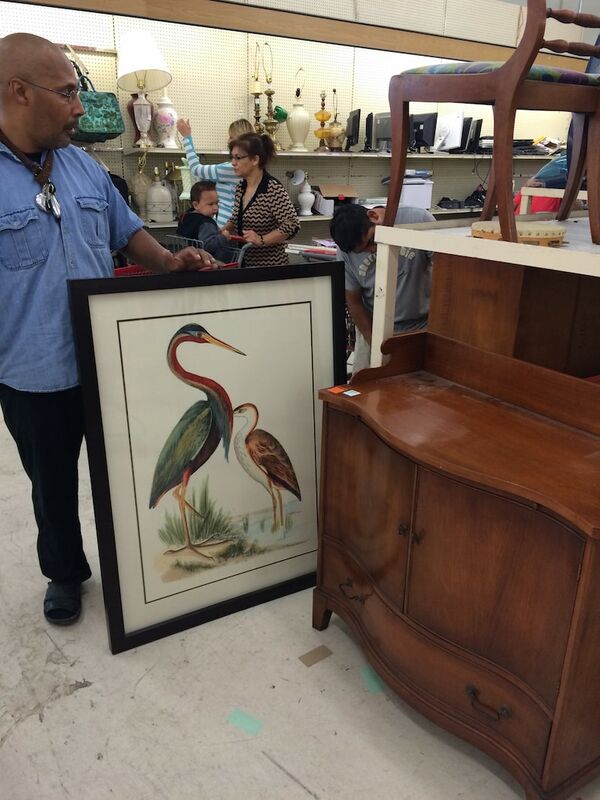 (Read my article What To Do When Attached By Vultures at the Thrift Store). 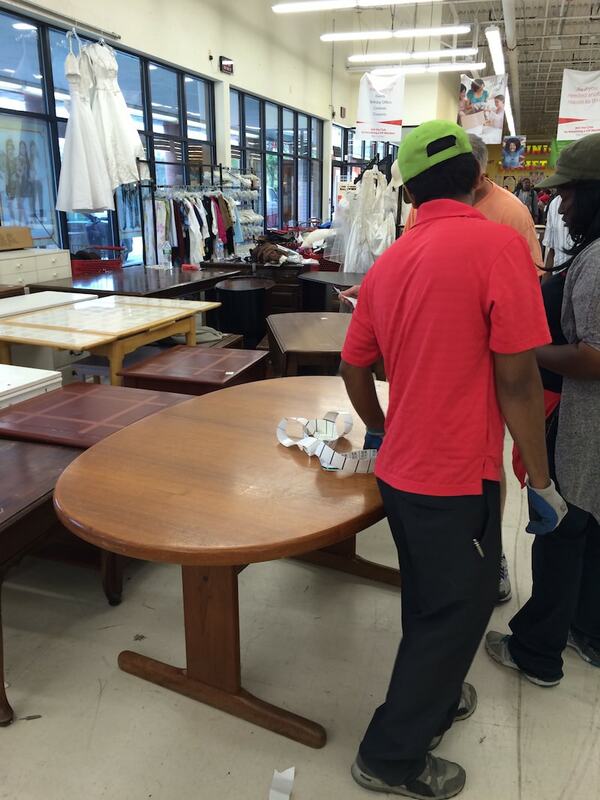 For these furniture flippers that scour the thrift stores every morning, ready to pick off the cream of the cop, ain’t nobody messin’ with their scores! And what was even funnier is that Pete said that that man in the light orange shirt was their well-known furniture flipping dueling competition! 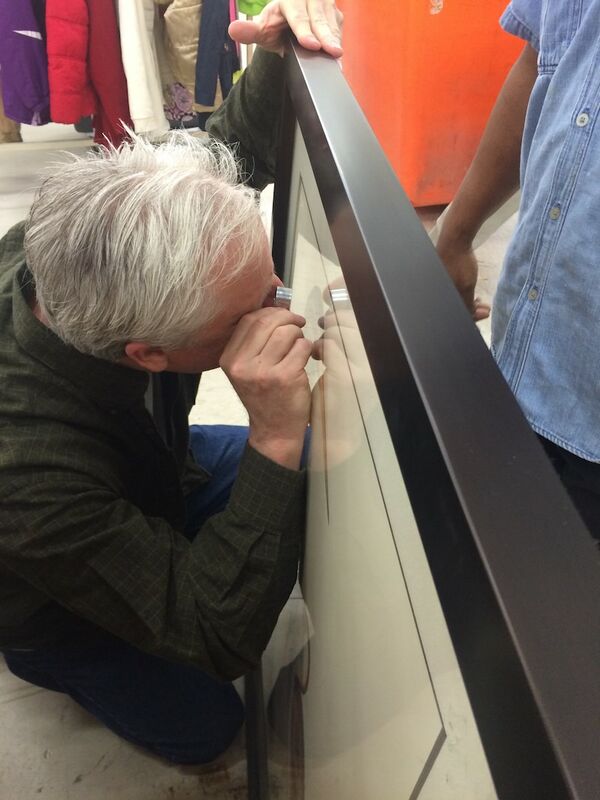 Then it hit me: while everyone else goes to work and thrift dives for fun evenings and weekends, the furniture flippers (mostly retired men) have scoured the cream of the crop early in the mornings with a vengeance, digging through piles of scraps looking for diamonds! And suddenly I was on their turf, in the middle of their “everyday,” seeing the other side of thrift diving: the hungry side, the furniture flipping side. And it almost felt like I was silently being voted into their club. Finally, I had found my “people”! 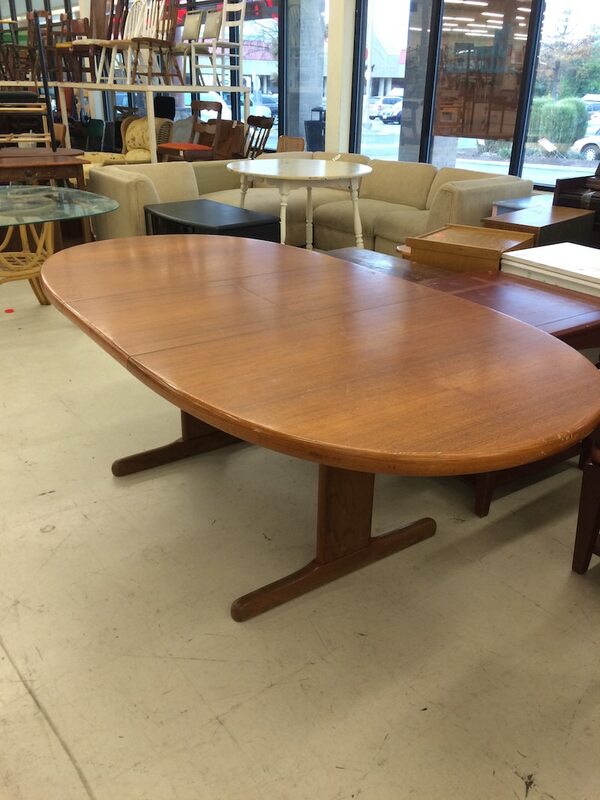 I did happen to find what I was looking for while there: a coffee table. Blah….plain…simply functional for my 30-Day Makeover Challenge in my family room. But after Pete glanced it over and said, “Nah, this is crap. You should look for the solid wood” I ditched it. I’ll find something else, I guess. Or build something with my own hands. I had walked by it. 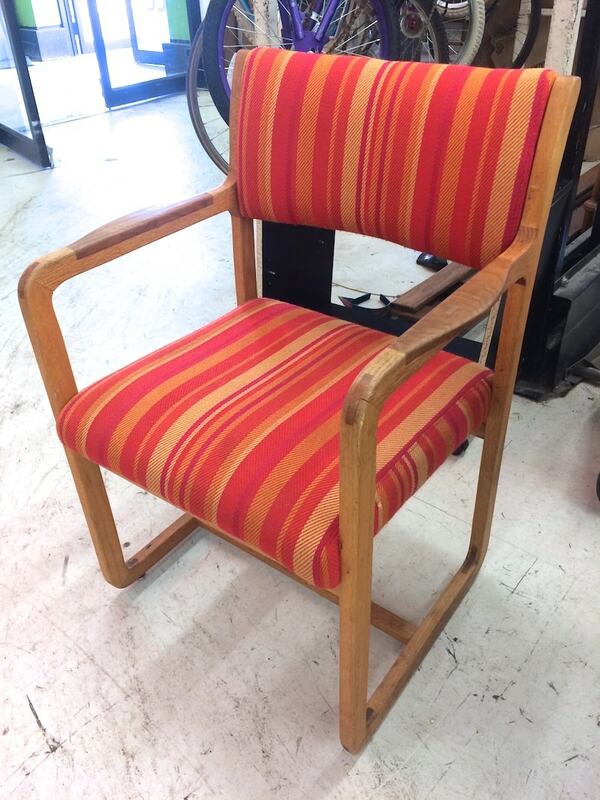 Until Pete pointed out all the well-constructed joints, the great stitching the 60’s fun and funky fabric. He was right. This was a cute mod chair. And it must have been a hot item, because wouldn’t you know some other furniture flippers were stalking it before I shooed them away. So for $10, I scooped that mod chair up real quick! First, this man was walking by with this ornate wood carved chair, and I just had to stop and ask him if I could snap a pic of it to show you guys! He walked away like a cat who got the mouse!! LOL It was hilarious! Everyone was feeling the craze that morning! 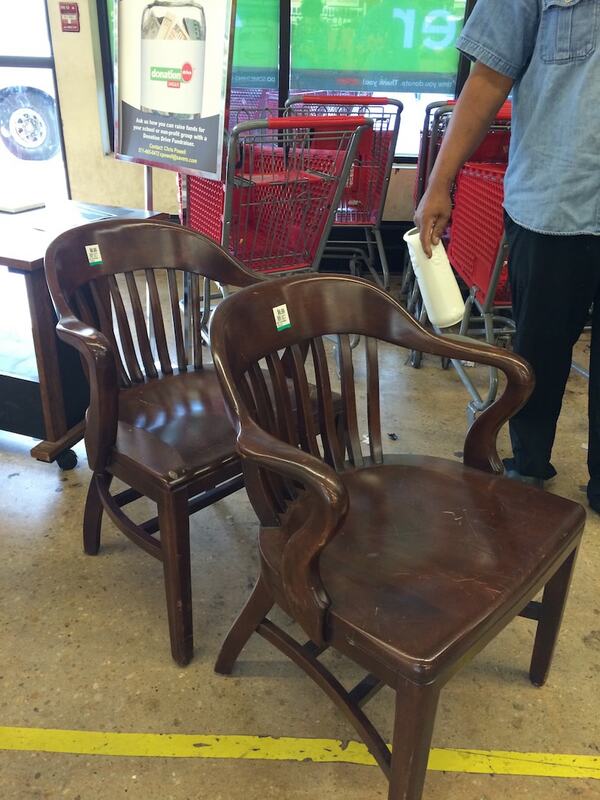 And I can’t get over these chairs…. Pete found them before me. Otherwise, they would have been coming home with me. For $6.99 each, I wanted to find the person who priced them so I could examine them in the head because they must be insane!! They’re gorgeous for an office!!! Last but not least, here’s a little something else I saw that was really cute, too! I want to say it was $40?? Can’t see close enough on the tag. 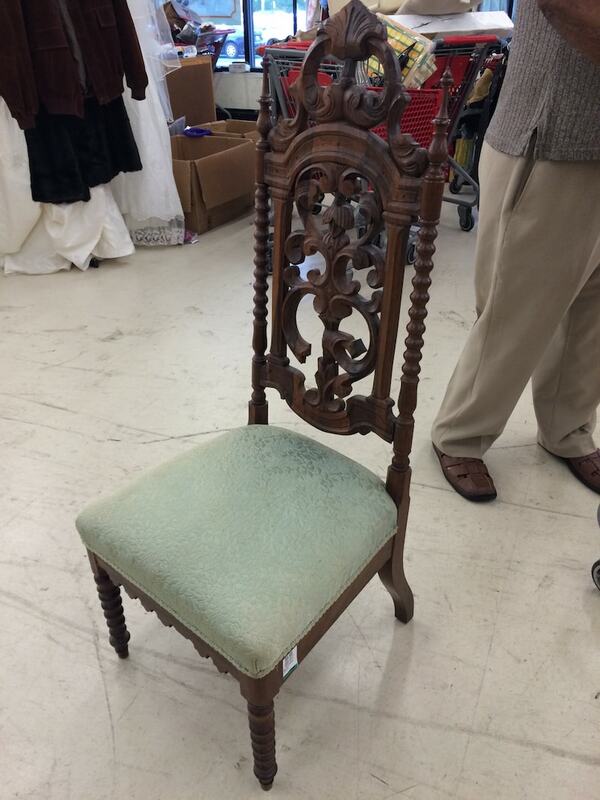 And for $20, this would have made an amazing chair makeover, too! But you just can’t bring it all home, can you. After 3 hours, I finally ripped myself away from the thrift store and all these interesting guys. I knew I’d be seeing them again on my next early-morning venture to the thrift store. Next time, we can be on the hunt together. Feels good to be a part of the tribe. 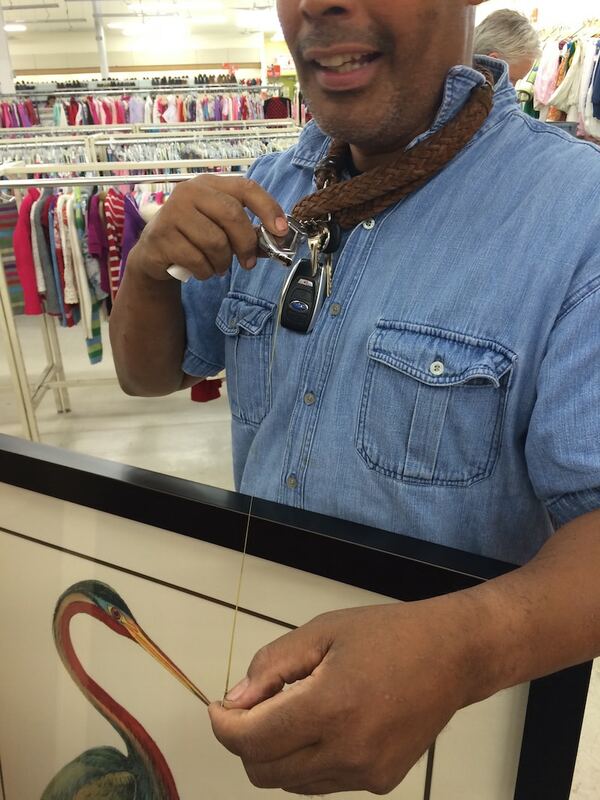 So do you have any interesting stories from the thrift store to share? Leave a comment below and let’s hear it! Hi Serena! 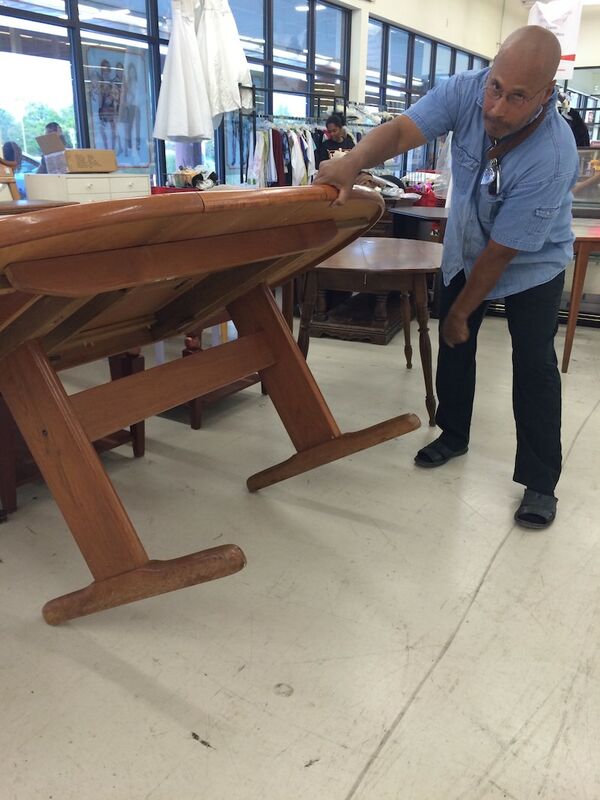 I bet I could give a quote….”Great fun was had by all on your outing to the Thrift Store”. Right? I love reading about your enthusiasm at the treasures you find! I love finding those treasures too! Your enthusiasm makes me want to rent a truck and go shopping. But I am at the point that it is time for me to downsize, and quit collecting. Awwwww that makes me so sad. But ’tis true…. This weekend, Saturday, October 7th is our church Bazaar that I have helped with for over 30 years. I was sorting and helping to price treasures in the Glass Room. There is also a Wood Room, Kitchen Room, Linen Room. Books, Toys. Outside a Garden Shop, and a large tent with things we can not fit into the building. Food as well, and a Bake shop. I wish you could come for it. I know you would have a great time. And find more treasures for yourself! 9-3. The Quilting Circle made a quilt and it is hand quilted too! ( and I helped…) I wish I would have taken a photo. Shoot. Perhaps I can get one tomorrow…. Salem United Methodist, in Virginia Beach. Virginia, of course. If you can make it, come find me….I will be near the kitchen. I recently discovered your blog and OH MY WORD I’m obsessed. 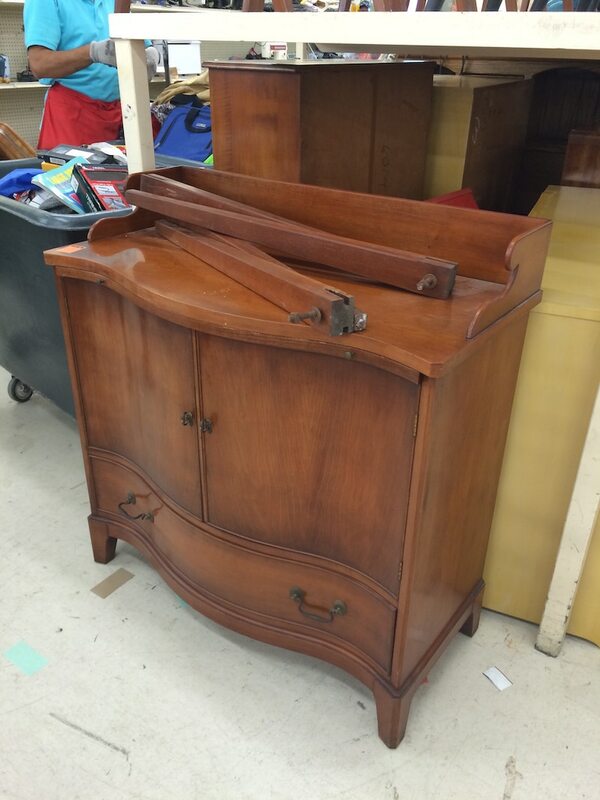 I live in DC (recently moved here from FL) and am on the hunt for good thrift/consignment stores so I can give this rehabbing furniture a try. Any suggestions of places to go? Also, a few weeks ago I went to the Lucketts market. AMAZING. I can relate to this story. My hubs and I used to sell merchandise at flea mkts for years. Not furniture, but other things. Flea market vendors are an “unusual” breed. LOL!!! LOL, Amanda! 🙂 They are special people, indeed! Great to learn from, too! Gorgeous furniture! I love learning from the “experts”. Not that I always take their advice…. lol When I lived in an apartment, I had a very small dining area. 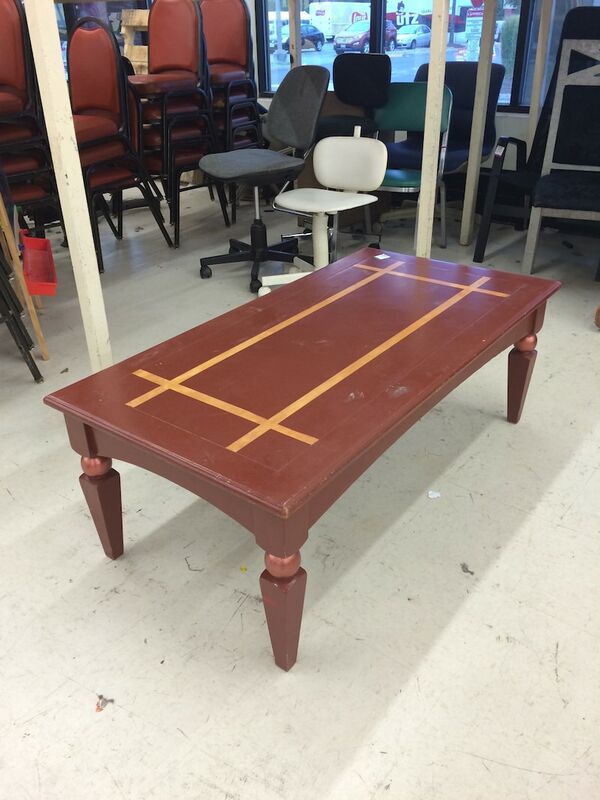 I searched high and low for a table and finally found one at GW for $9.00. solid oak, round with a leaf… I love it. It now sits in the kitchen of my house, since I don’t have a dining room. 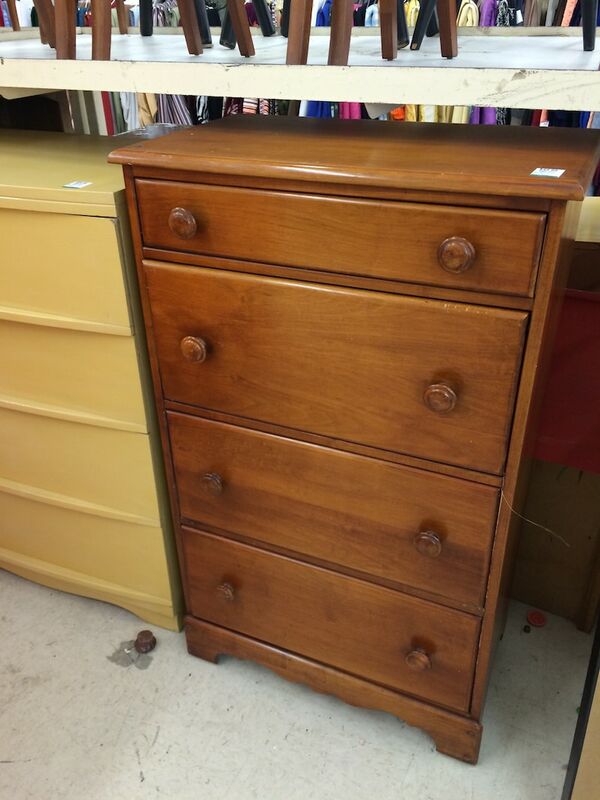 I also bought an oak sideboard that I use as a dresser and a solid wood dresser that I had to replace the knobs on, I paid $14 for the sideboard and $5.00 for the dresser. 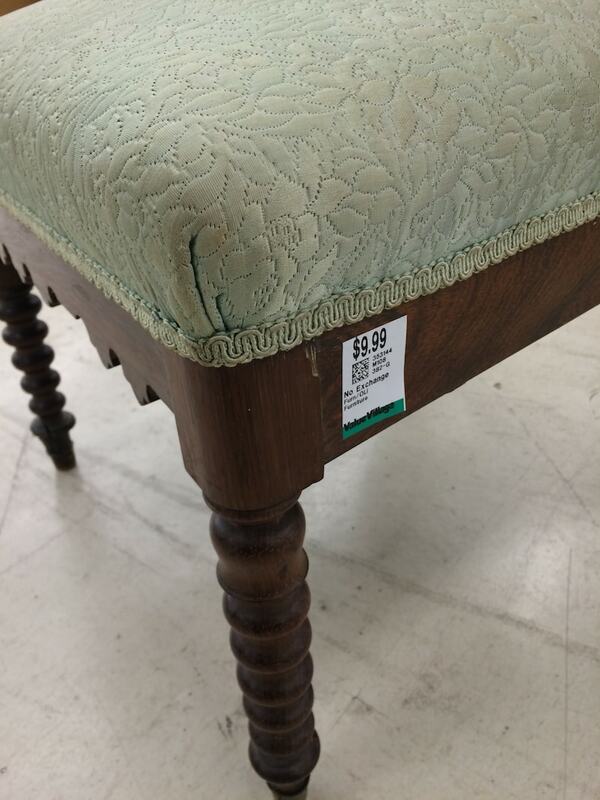 I love finding a bargain, it’s the thrill of the hunt! My niece lives in Harpers Ferry, WV…. 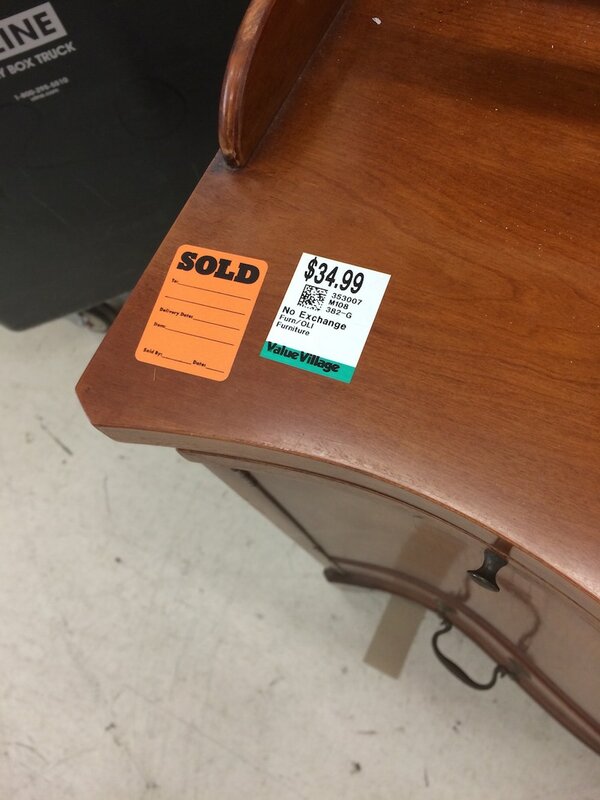 I may have to visit her and head into DC for some thrifting….. I enjoyed reading about all the drama. I love that thrift store! I always find exactly what I’m not looking for and more Hahaha! Oh, man, Serena, you just make me GREEN with envy!! 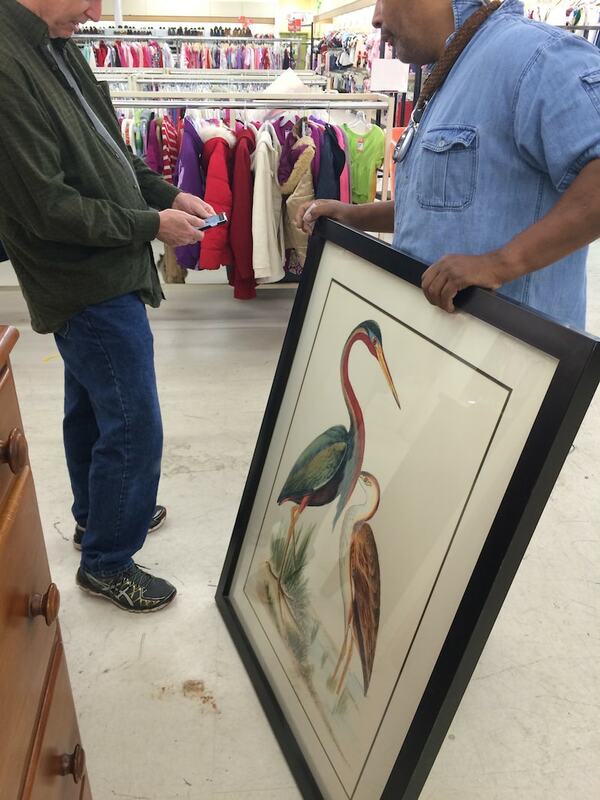 You have the BEST thrift stores in your area! But maybe it’s a good thing I don’t, because I’d have to rent a storage unit for all the stuff I’d be tempted to buy! Love your chair find, though; it’s really cool. 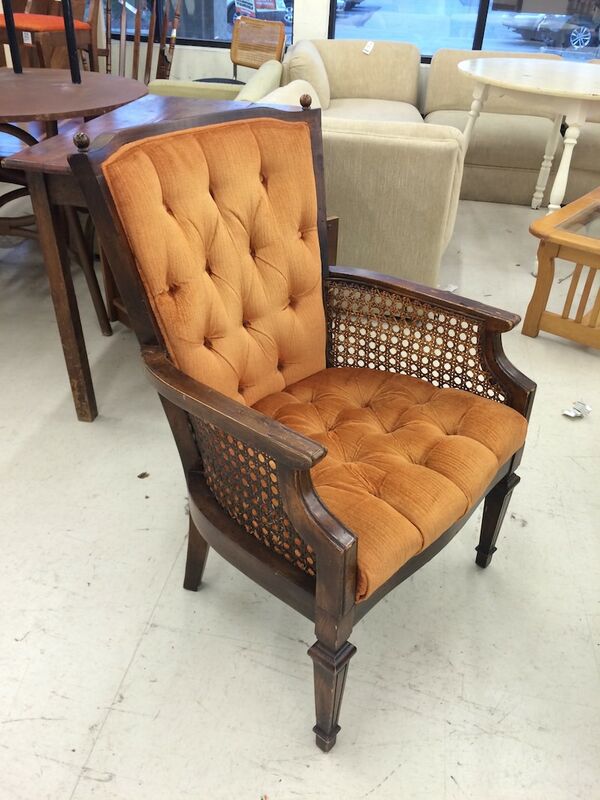 I need a chair for my living room that will be comfortable for knitting so I keep looking. Some day I’ll be lucky and find it! Meantime, I’ll keep busy trying to put my new apartment together. It will take some time because I have such an eclectic mix of stuff, some good, some not, and uncoordinated colors, most of them way too light. I think I mentioned before that the entire apartment is painted a creamy off-white and I can’t change that. I’ll have to really use my imagination! There are no curtains in these apartments; only mini blinds. I keep thinking about making curtains/drapes and trying to decide on a color scheme. I have some soft teal fabric, but it doesn’t go with my couch (gold and flowered with deep red and greens) or my recliner (blue velour) or my comforter (cream w/red flowers and dark green stripes). That comforter is definitely not a long term keeper, although I like it. My favorite colors are greens and blues, especially the sea green colors. I’m keeping the idea pot simmering on the back burner and sooner or later an idea will gel and I will move ahead. That’s one thing with being retired; there’s no great rush to do anything. Well, that’s enough babbling for today. I really enjoy reading your posts and find lots of ideas that I will eventually be able to incorporate at some point. Keep up the great work! Hey, Teckla! Oh…..but you are wrong, my friend. When you join one of my 30-Day Room Makeover Challenges, you have a deadline! LOL That is the rush! I find that is the only way to get something done: when you have a date that requires you to get done. Otherwise, I diddle-daddle on things. Your cream walls aren’t bad! I just painted mine that color, in fact, because it keeps things bright. As for the sofa, could you make a slipcover so that you can use the teal fabric and it won’t clash? I think you just have to join one of my challenges :). It’s the only way I get anything done around here, either! Thanks, Serena. I have thought about a challenge, but I don’t work well under pressure. Also, I’m still digging out my sewing area since this move. I truly do have way more stuff than I have room for and it’s been interesting trying to organize the rooms while getting rid of stuff I really don’t need. It’s interesting how we change as we grow older. I used to collect stuff with not a lot of thought about time involvement or the future, but not any more. I’m only 68 but I have come to realize that there is no way I am going to be able to do all of the things and use all of the “materials” that I have accumulated through the years, especially the crafting, needle arts and all the other hobby stuff I have. (Trust me, I could open a store!) For the last few years I’ve been thinking about what I really want to do vs. the more casual interests I have; about what makes me the happiest and then viewing that realistically with the space, financial and other resources I have available. It’s a very interesting journey, but ultimately is making for greater happiness to have my interests focused on a smaller scope. Does that make sense? I have so many interests I’m sure I’ll never run out of things to do! LOL! And, yes, I might possibly slip cover the couch. I need to dig out the fabric again and determine if I have enough to do both. As well as the couch, I have 3 windows, living room, dining room and deck door to consider/coordinate so style would be important as well as considering coordinating with another fabric.Other than WalMart, nearest fabric store is about 20 miles away so a shopping expedition might be in order! Oh, that is so cool, Gracie!!! It’s fun when you get something for such good quality and people don’t know what’s under their noses!!! Thanks for sharing that!